Today I’m going to show you three funds that are clobbering the market while throwing off a princely income stream. 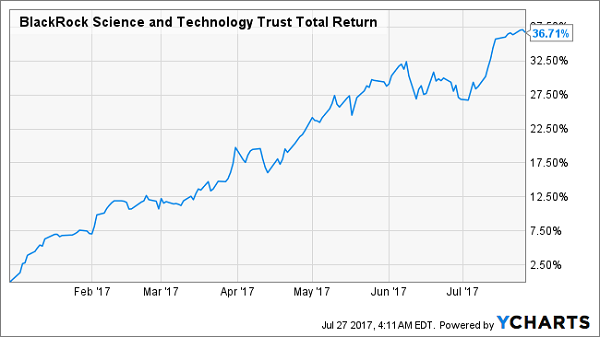 These three funds have all gained 30% so far in 2017, even though the market is up a more modest (but still solid) 10%. And thanks to their skilled management teams and the exploding corners of the market they play in, they still have plenty of room to run. The best part: between them, they pay an average 6.5% dividend! And thanks to their strong outperformance, those payouts are going to keep flowing to shareholders. So you could buy all three of these funds, get a huge passive income stream now and position yourself for strong capital gains, thanks to the steady growth in these funds’ net asset values (or the value of their underlying holdings). All three are closed-end funds (CEFs) that invest in very different things. The first is the BlackRock Science and Technology Trust (BST), which has some strong-performing positions in Facebook (FB), Alibaba (BABA), Avago Technologies (AVGO), Salesforce (CRM), Visa (V) and Mastercard (MA). If you’ve read my previous articles, you may remember that I recommended BST a month ago, just when its bull run took a bit of a breather; it’s now up 5.7% since my call. 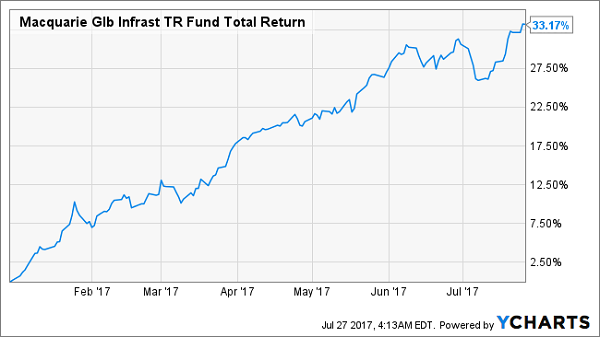 My second fund is up a similarly impressive 33.2% for 2017, although it’s a different beast; the Macquarie Global Infrastructure Total Return Fund (MGU). Buying MGU now may not be as good as buying it in March when I first recommended it (it’s up 15.9% since then), but it can still roll higher thanks to a reprieve in oil costs and a weaker US dollar. Notice how we have a bit more of a pause in STK’s bull run compared to the other two picks? That makes this fund much more attractive now. I first recommended it a couple weeks ago, and it’s up only 1.6% since then. 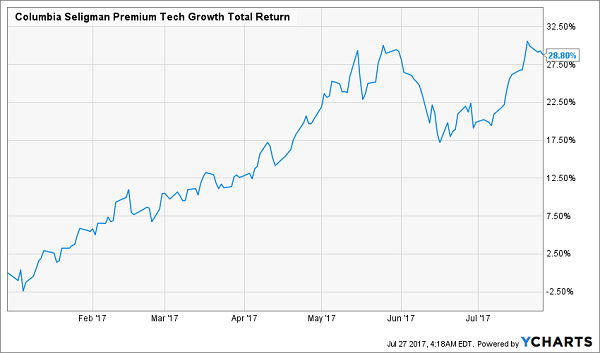 That means there’s room for plenty more upside as this fund narrows the gap with its tech-focused cousin BST. My 4 Top CEFs Are About to Explode 28%: Buy NOW! 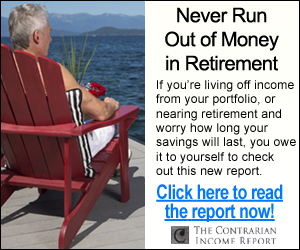 The 3 funds I just told you about could be great fits for your portfolio, but they’re not even close to my very best CEF buys for BIG gains and income now. I’ve just released the names of my 4 favorites in a brand new FREE report that’s just waiting for you now. These 4 screaming bargains are set to hand you gains of 20% (or more) in the next 12 months alone! Oh, and you’ll be collecting a nice 7.5% average yield, too, so your real gain is closer to 28% here, with a nice chunk of that in cash! Best of all, you’re still getting some reassuring past performance that stretches back way further than just the beginning of 2017. It’s handily beaten the S&P 500 since the 1990s! Thanks to the weird mispricings in the CEF world, it still trades at a ridiculous 8% discount to its net asset value! 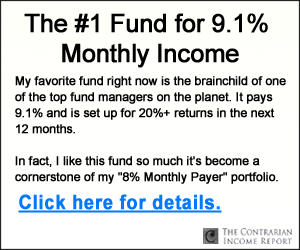 I can’t wait to tell you about this amazing fund and the 3 other picks I have for you. As I mentioned, they pay an average 7.5% payout now, and they’re poised for 20% upside in the next 12 months! But their bizarre discount windows are already starting to close, so you need to move quickly. Go right here to get full details—names, tickers, buy prices and more—on all 4 of these powerful funds now.